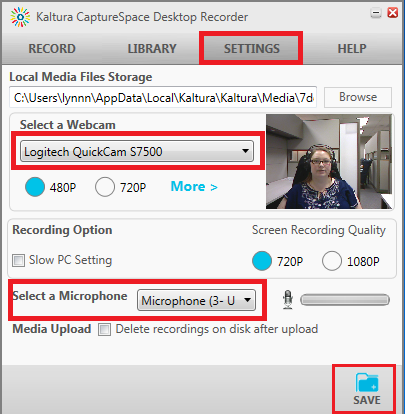 Note: If you have not downloaded and installed the desktop recorder, see Download CaptureSpace Lite. 2. Click on Kaltura and then My Media in the Navigation block on the left. 3. 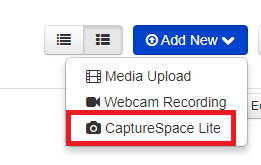 On the right, click the Add New menu and select CaptureSpace Lite. 5. Click the Settings tab to choose your camera and audio options. When finished, click Save. 6. 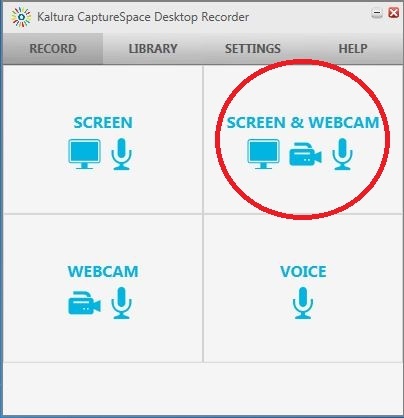 Click the Record tab and select Screen & Webcam on the Desktop Recorder. 7. Select the screen size you wish to capture. 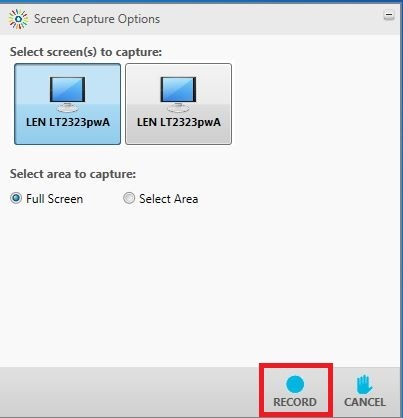 If you choose Full Screen, you can begin recording by clicking the Record button. 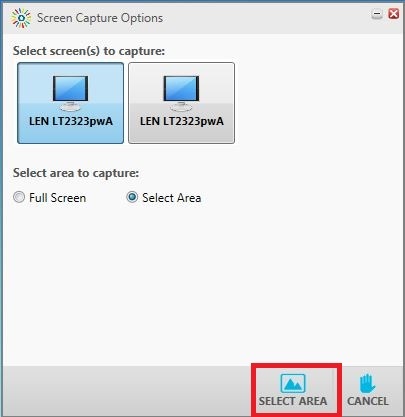 If you choose Select Area, click the Select Area button and drag your mouse over the area you want captured. 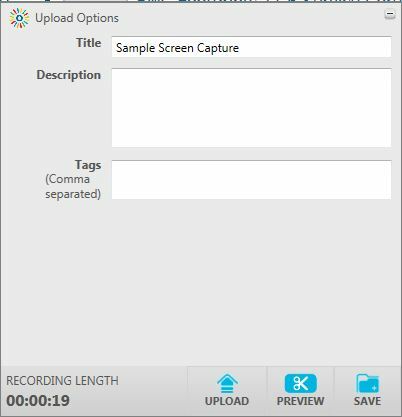 When you release the mouse, recording will begin automatically. 8 During recording, your webcam footage will be in a window that floats on top of whatever is being captured. Click and drag the window to move it around the screen to a discrete location. Cancel: cancels the recording. You will have to confirm the permanent deletion of the recording. Trim: This trims the recording frames at the beginning and end of the recording. Once the segment(s) are selected, click Apply. Chop: This removes a selected segment from the recording. It can be removed from any part of the video. Once the frame(s) are selected, click Apply. Note: You can only chop one segment from the recording. Titles: Adds a title screen to the beginning of the recording. You can select from a collection of designs and then add the title and description. Click Apply once finished. Credits: Adds a credit screen to the end of the recording. 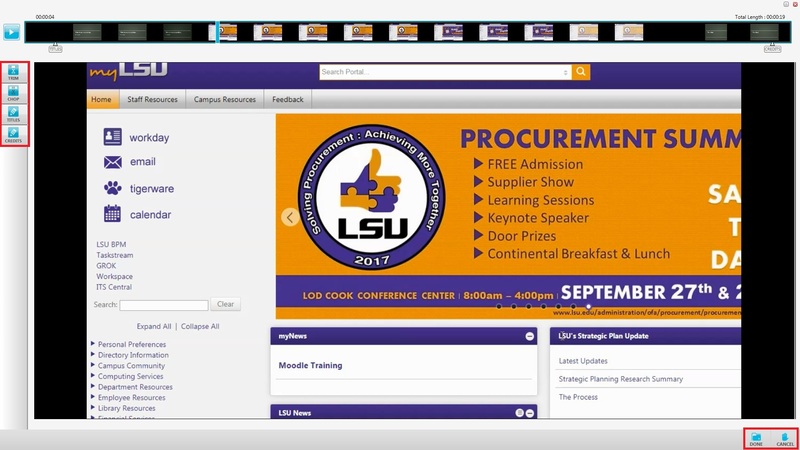 You can select from a collection of designs and add the text. Click Apply once finished to see the changes. 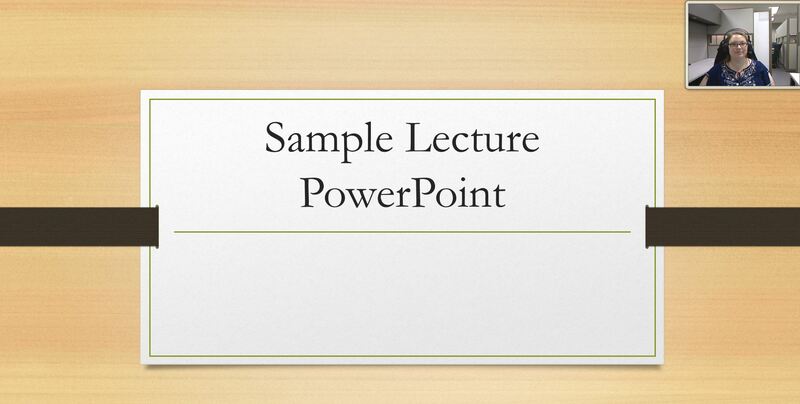 Upload: This will upload the video to the My Media area of Kaltura in Moodle and can be added to your course(s). 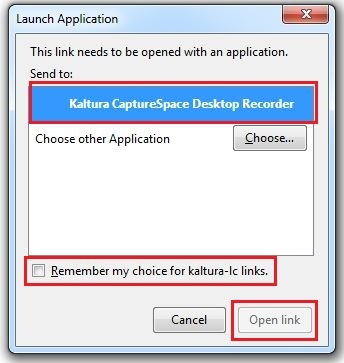 To add the video to your course, see Adding a Kaltura Video Resource.